Got this as part of a nice haul from Sam. Was told to drink this right away, but I was sick (and still was as I was reviewing this). Didn’t want to wait any longer. Had heard wonderful things about this one (4.60 on Beer Advocate - No. 51 and 4.49 on Untappd). Had regular PseudoSue before and loved it, giving it a 4.59 on Jan. 14, 2016. Also enjoyed Golden Nugget (4.09 on Dec. 5, 2016). Hoping this one will be at least a 4.50. Looks like hazy, pulpy orange juice carrying a fluffy little white head with some nice longevity. The aroma carries notes of a bountiful tropical fruit medley tempered only by a thin veil of juicy melon. The taste is just so balanced, highlighting bits of of mango, grapefruit, guava, pine, orange, melon, and a bitterness that's both prickly and refreshing; nothing is strong here, but everything is in place. Much like the taste, "balance" is the keyword when it comes to the feel of this beer. It carries an effortless smoothness with an effective carbonation that manages to feel both creamy and eminently juicy. Amazing to think this APA is the product of a single hop; they must've milked the Citra dry for this one. Pretty paradoxically, it's both complex and simple, and so balanced in its flavors that it's not typically the type of beer I'd turn to, and yet the spectacular structure of this one just can't be ignored. It drinks so nicely, that it's really the type you reach for if you're simply overwhelmed by options and just want a really satisfying pale ale. Thanks Jake for the trade! This is a spectacular brew, hands down. 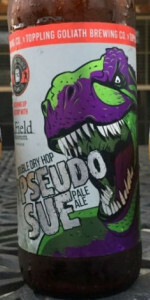 Double Dry Hopped Pseudo Sue is a real juice bomb. Taste is as on point as it gets. Taste follows the smell, juicy as hell. Well deserving of the 100 rating. Get it if you have the chance. Poured into a PseudoSue/Field Museum pint glass. Cloudy dark orangish gold, like a fruit juice with mild lacing after it poured a thick foam. Big dank citrus hop smell. Taste is straight up juicy-hoppy and citrusy, mild notes of tangy pine. Very mild drinker for something with such a strong presentation. An absolute treat that lives up to the hype. 22oz, bottled on 02/08/18. This beer eluded me one time - I passed on it at the store, but when I went back to get it a few days later, the shelf was empty. Glad to find more - and it's fresh! Murky and opaque pineapple juice appearance with a creamy white head. Huge juicy and floral aroma of passion fruit, lemon-lime, and grapefruit. Citric and tart in flavor with notes of passion fruit, lemon-lime, kumquat, grapefruit, and a hint of orange; malt is mild and seems to be a bit wheaty. Fuller body, quite resinous, finishing moderately bitter. Glad to try it but I prefer the regular PseudoSue. 1 week old PS poured into a glass. Pours a hazy yellow with a beautiful white creamy head. The nose is full of wonderful citrus, predominantly grapefruit and a hint of orange. The taste is wet and juicy with notes of grapefruit, orange and pineapple. It finishes with a clean, crisp hop bite. Its thirst quenching abilities are amazing. I'm generally always very skeptical of hyped beers, but this thing meets and beats the hype! Amazing and leaps better than regular PS. Bottled 3 days ago , very excited to drink this one so fresh. Crystal clear, not what I was expecting. I would much prefer the Murky orange Sue of a few years ago. Lots of tropical fruit in the nose. Citra bomb, as expected. Very fruity flavor and a little bit dry. Very easy drinker. great carbonation and very smooth. Good beer but I think I prefer Regular Sue (which I thought this was when I bought it, as the only indicator that is was DDH Sue, is tiny on-bottle print above the date code). Thanks to umichifan for this. Poured on the wife's birthday. Not too many words for this beer. Perfect appearance with the right amount of haze. Aroma is on point with plenty of citrus notes, grapefruit, and faint hints of pineapple. Taste is on par with aroma. Grapefruit / citrus notes to carry the beer through. Mouthfeel was light to medium with a creamy afterfeel. Overall this is a beer that must be sought out. Definitely the best pale ale I've ever had. I would keep this stocked in the fridge if it was available in my area year round. Might not be my favorite beer of all time, but definitely my favorite pale ale. Overall--fantastic brew, and I'm a treehouse snob who vastly prefers NE IPAs, but this is right on par!